"These awesome Jell-O® shots make for a great party hit!" Heat soda in a medium-sized pot over medium heat until simmering. 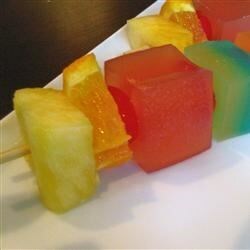 Pour in pineapple gelatin mix and stir until fully dissolved. Remove mixture from heat and stir in peach schnapps and cold water. Cool to lukewarm, 5 to 10 minutes. Pour mixture into 2-ounce cups and refrigerate until set, 3 to 4 hours. A classic cocktail in one fun shot! If cups are hard to find, pour into a large cake pan. Once set, cut into squares or fun shapes with cookie cutters and thread them on skewers.